An archaeologist has uncovered the remains of an ancient burial cist and pottery at the site of a new £1.3m health centre on Skye. No human remains have been found, but further excavations and chemical tests on material recovered will delay the building project for about two weeks. Archaeologist Steven Birch also found a cairn and an underground structure known as a souterrain. NHS Highland said it still expected the centre to be completed by March 2012. 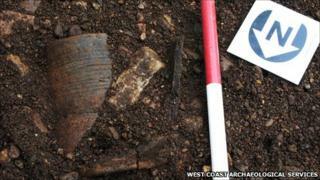 The finds could date from the Iron Age. Mr Birch, of West Coast Archaeological Services, said: "There is a surprising range of important archaeological features within such a small area on the site. "Not only did we uncover the remains of an intriguing cairn-like structure, but there were numerous other features, including a grain-drying kiln, an underground stone-lined passage and a burial cist containing a ceramic Beaker vessel. "The site is currently being excavated by a team of Highland-based archaeologists and the investigation is revealing exciting new discoveries."